Dosa is a fermented crepe or pancake made from rice batter and black lentils. It is a staple dish in South Indian states of Karnataka, Tamil Nadu, Andhra Pradesh and Kerala. It is also popular in other parts of India, and other countries like Sri Lanka, Malaysia and Singapore. Dosa is indigenous to South India; its exact birthplace in that region is a matter of conjecture. According to food historian K. T. Achaya, the earliest mention of dosa (as dosai) can be found in the in the Tamil literature of 6th century CE. According to P. Thankappan Nair, dosa originated in the Udupi town of present-day Karnataka. In popular tradition, the origin of dosa is linked to Udupi, probably because of the dish's association with the Udupi restaurants. Also, the original Tamil dosa was softer and thick. 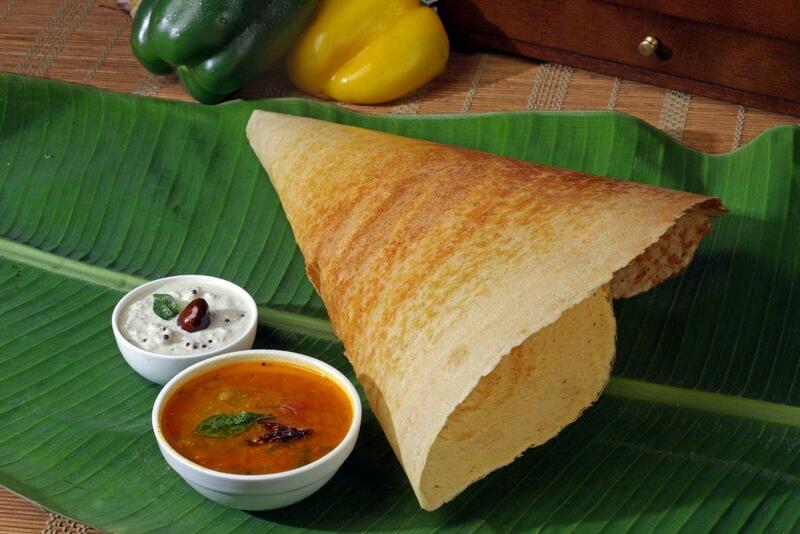 The thinner and crispy verison of dosa, which became popular all over India, was first made in present-day Karnataka. A mixture of rice and urad dal (ulundu) that has been soaked in water is ground finely to form a batter. The proportion of rice to lentils is basically 4:1 or 5:1. The batter is allowed to ferment overnight. After the overnight fermentation, batter is mixed with water to get the desired thickness. the batter is then ladled onto a hot tava (griddle) greased with oil or ghee. It is spread out evenly with the base of a ladle or bowl to form a pancake. A dosa is served hot, either folded in half or rolled like a wrap. It is also served usually with chutney and sambar. The mixture of urad dal and rice can be replaced with highly refined wheat flour or semolina. 2. Wet chutney: examples include coconut chutney (a semisolid paste made up of coconut, dal (lentils), green chilli and mint or coriander). 3. Dry chutney (podi): a powder of spices and desiccated coconut. Dosa, a common breakfast dish and street food, is rich in carbohydrates, and contains no sugar or saturated fats. As its constituent ingredients are rice and Urad Dal (Vigna mungo), it is gluten-free and becomes a complete protein. The fermentation process increases the vitamin B and vitamin C content. There are also instant mix products for making dosa, with somewhat lower nutritional benefits.